Crestron, a world leading innovator and manufacturer of home and workplace control and automation solutions, have in the past few days announced that their new AM-300 AirMedia 2.0 Wireless Presentation System will be shipping in Europe from the end of April. 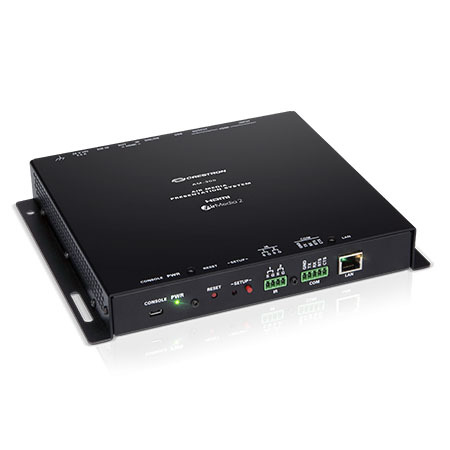 Described as delivering the fastest, easiest, most manageable, and secure wireless presentation technology, the new AM-300 presentation system features the second generation of Crestron’s AirMedia technology. That second generation of AirMedia technology delivers a raft of notable benefits to users of the new AM-300. Those include the lowest latency for optimal network efficiency, and the lowest bandwidth consumption so keyboard and mouse movements track in real-time. As well as featuring the impressive AirMedia 2.0 technology, Crestron’s new AM-300 system also includes a DM input, HDMI in and out, LAN port for power and communications, and full display control. If you would like to discuss your requirements for Crestron enterprise solutions please call us on 0800 195 4825.